I was lucky enough to be chosen by Lesley and Caroline for their Autumn Design Challenge - have a look at the goodies that they sent me! Sue your designs are great - you've done so much with your beads and I love your resin components and the way you've echoed the beads you were given. I'm also a big fan of wire cocoon beads too so I love that bracelet. Thank you very much for taking part in our challenge. Thanks Lesley - glad you like what I did with your lovely art beads. Thanks for including me in this challenge. 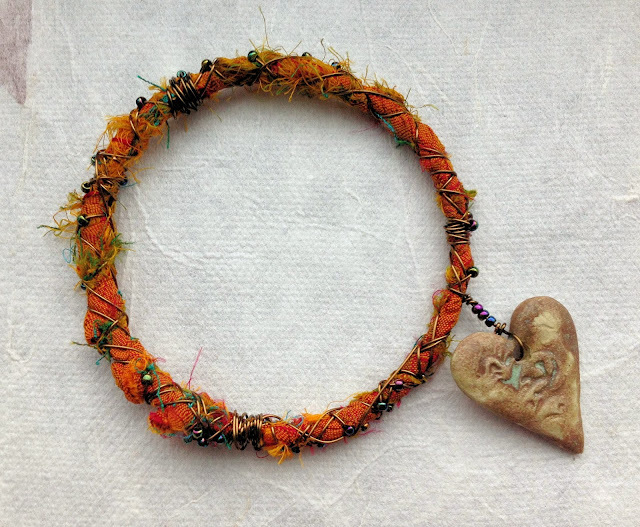 I've been wanting to find the time to make a sari silk wrapped bangle too! Really glad that Lesley and Caroline's challenge gave me a chance to get on with it! Glad you like what I did. I'm definitely happy to give Smitten Beads a mention - it is a great site! All your pieces are so beautifull. I also love your resin components. Love all the beautiful pieces you made. You also tried so many interesting techniques too. 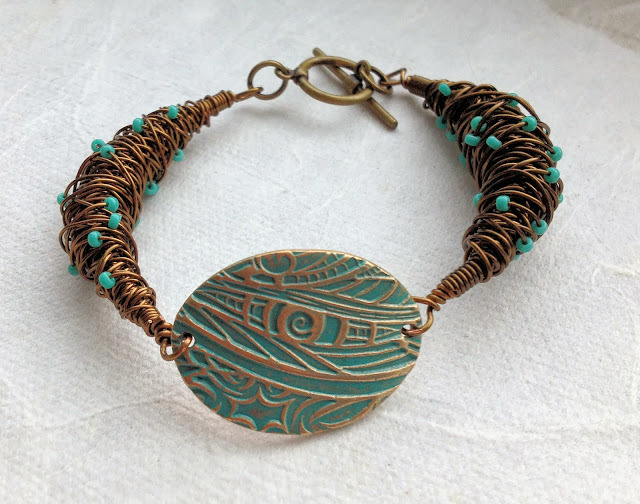 I really love the cocoon beads on your bracelet and the resin beads are pretty awesome too. Great job on all. Thanks for making me smile - what a lovely comment! 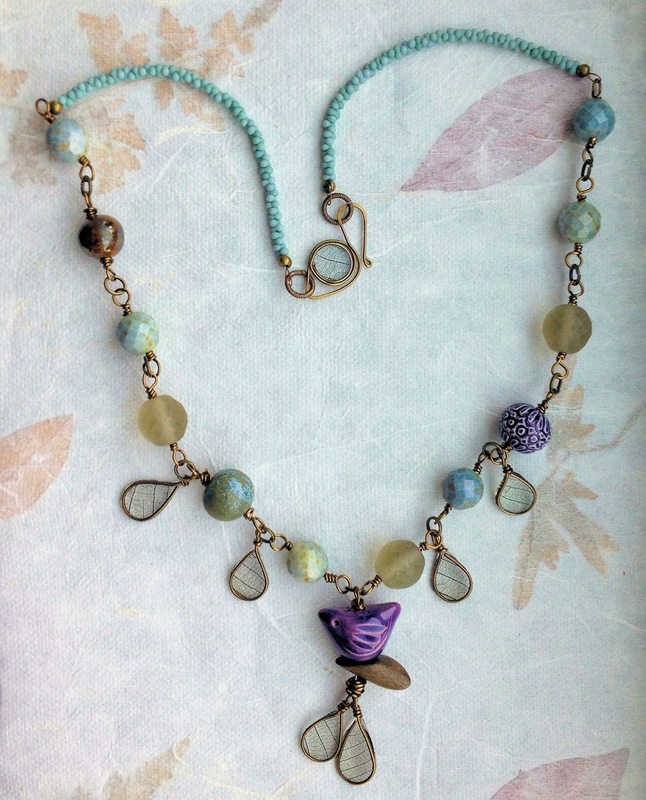 Well, I'm pretty much just speechless...love the soft color palette in the first necklace, and your resin beads are awesome! I'm thrilled with the shape of your resin beads in the second necklace, they echo the focal perfectly. My daughter and I both fell in love with the wire cocoons, those are amazing! And your sari silk bangle is a huge hit as well! High praise indeed - thanks so much! I've just been trying to pick a favourite, but I don't think I can! They're all stunning! I love your resin work too, keep experimenting! Thanks Caroline - glad you like tem. I really enjoyed working with your lovely beads. Thank you - I think that is my favourite too! I love the use of the peanut beads on the necklaces. What a great idea to add colour and texture to the design. I am a little obsessed with peanut beads. As you say they add some texture and come in great colours. Love what you've done with the resin, what a great effect! lovely colours you've put together! Both bracelets are precious! Love them! Thanks Ambra - much appreciated! Sue - Your designs are so beautiful! I am in awe! What a lovely comment - thanks! 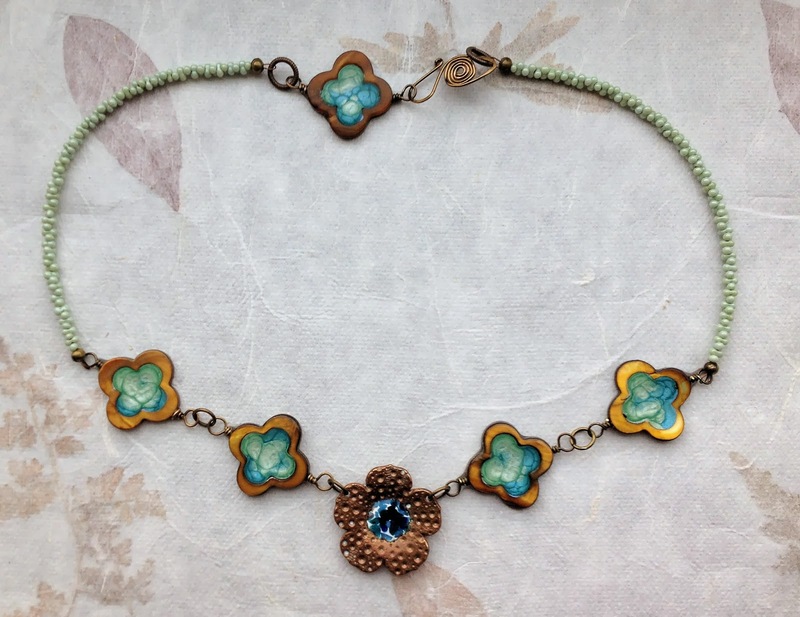 Gorgeous designs, love the resin leaves and links in the two necklaces. Thanks, I love working with resin - it is so versatile. Thanks for visiting.